I recently had a Twitter conversation with Kev (a great follow on Twitter) of Windy City Gridiron (a great Bears site you should definitely check out) about how passing has changed in the NFL in the last 10 or 15 years. He shared that 5 quarterbacks passed for 4,000 or more yards in 1999, 5 in 2004, and 11 in 2014. I speculated that this might be based more on passing attempts than anything, and that turned out to be true; from 1999 to 2014 the top 10 passers based on yardage increased from 524 to 598 pass attempts (12.4%) while increasing from only 7.4 to 7.6 yards per attempt (2.6%). This small snapshot got me thinking, and I decided to study how the passing game has changed in the NFL from 2002 (the first season with 32 teams) to 2014; all stats come courtesy of ESPN‘s database. I started by looking at passing across the league as a whole. From 2002 to 2014, passing became slightly more frequent; passing attempts per game (which I calculated as passes plus sacks) have trended from about 34 to 37 per game. At the same time, runs per game have dropped slightly from 28 to around 27, meaning the overall passing percentage has increased, as you can see in the table below. So teams pass it more in the modern NFL than they did 10 to 12 years ago, but not by a huge amount. I also find it interesting that the average number of offensive plays a team runs per game has increased slightly in the last ten years, and all of those extra plays are passes. Next I want to look at how effectively teams throw the ball. I’ll start with the basic passer rating, the standard measure of passing efficiency (I did not use ESPN’s total QBR for a variety of reasons, including that I can’t break that down by component because the formula is not public and their database only goes back to 2006, limiting the sample size). Passer rating has increased fairly steadily in the NFL since 2002, with a few fluctuations, as you can see below. The biggest thing that stands out to me from this graph is the massive jump in 2014; after gradually increasing from 81 to 84 from 2007 to 2013, it jumped to 87 in one year. I’ll be curious to see if that comes back down a bit in 2015 or not. Passer rating is calculated from four components: completion percentage, yards per attempt, touchdown percentage, and interception percentage. I tracked each of those categories from 2002 to 2014, and generally they all got better over time. You can see that in the graph below; note that interception percentage dropping is actually getting better. In order to put all four categories on the same graph, I took the average of each for the 13 seasons as a whole and calculated their z-score for each season. If you’re not familiar with this, basically 0 is average, above 0 is higher than average, and below 0 is lower than average, with the values getting farther from average the farther from 0 you go. The full data can be viewed here. I also looked at how sacks have changed since 2002, and found that the answer is not much. 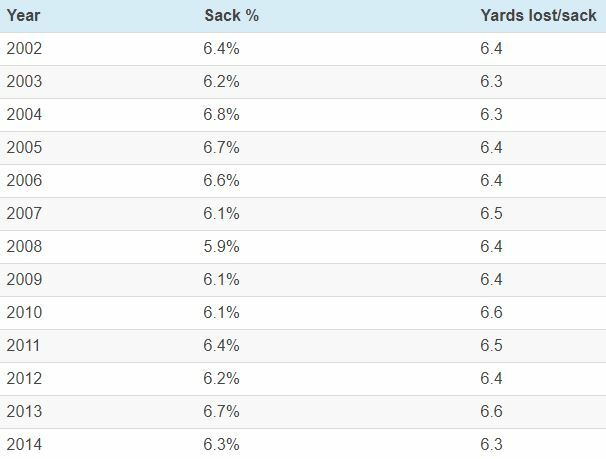 As you can see in the table below, sack percentage has remained fairly steady, with year-to-year fluctuations, as has the average yards lost per sack. Finally, I looked to see how rushing has changed over the same time period. 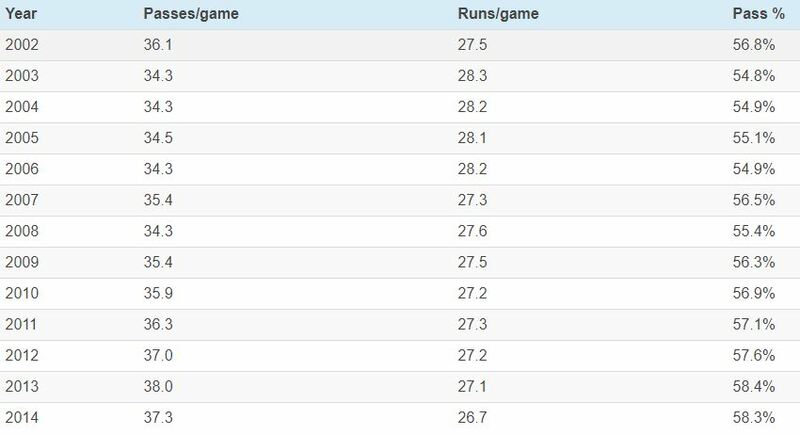 As I said above, teams average roughly 1 run per game fewer now than they did 10 or 12 years ago, but how well they run the ball hasn’t really changed in that time period, as you can see in the table below. Since 2002, the NFL has fluctuated between 4.0 and 4.3 yards per carry, with no clear pattern that I can discern, and they have scored touchdowns on roughly 3% of their runs. If anything has changed, teams have gotten better at avoiding fumbles, as those have take a slight downward tick from 2% down towards 1.5%. In the last 13 seasons, NFL teams have gotten better at passing the ball. They complete more of their passes, average more yards per attempt, throw more touchdowns, and throw fewer interceptions. What hasn’t changed is how often they get sacked and how many yards they lose when that happens. 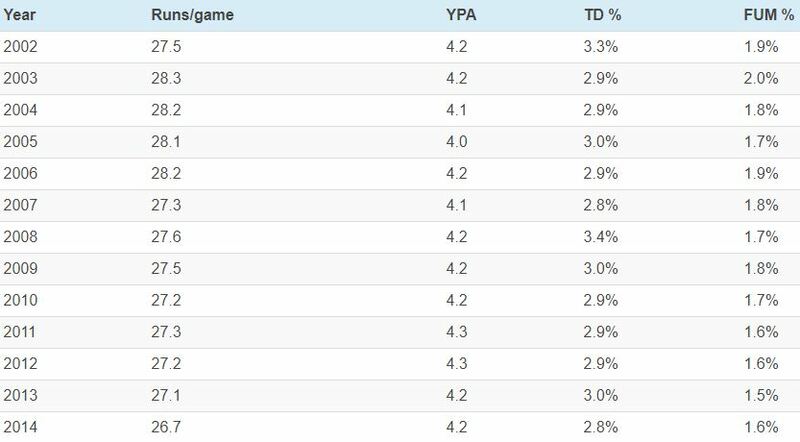 The running game has also remained fairly steady in terms of yards per attempt and touchdowns, though teams have gotten better at avoiding fumbling.